One of the most common Grand Canyon mistakes connects to the river that made the entire place possible. 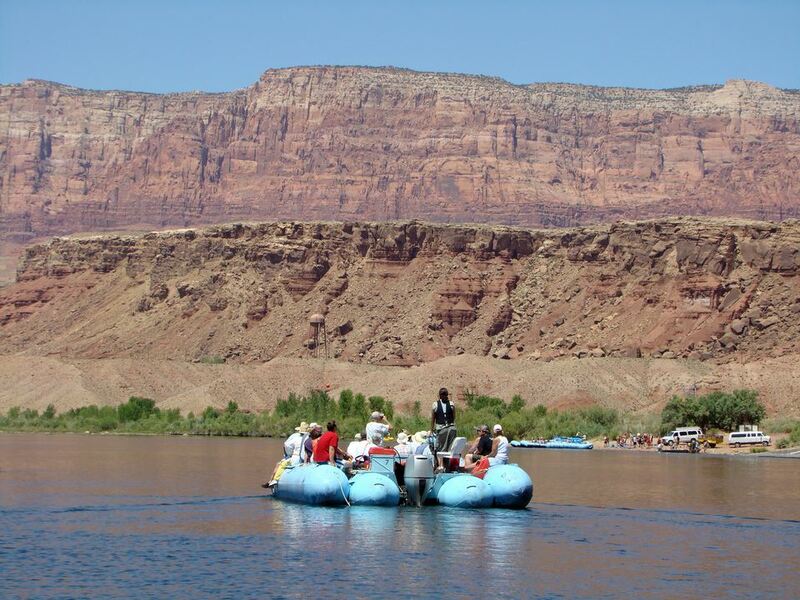 An alternative for budget travelers who are short on time but still want to experience the Colorado River: Half-day float trips such as those offered by Colorado River Discovery that leaves from Page, about 140 miles northeast of the South Rim. The cost is steep but the experience is unforgettable. Note that these trips do not enter the Grand Canyon itself and that there are no rapids to navigate. About 90 percent of visitors approach Grand Canyon National Park from the South Rim entrance. Unfortunately, some of those people pause a few minutes, drink in the marvelous view, and then depart, checking off the Grand Canyon box on their bucket lists. The South Rim entry point includes Maswik and Yavapai Lodges, camping facilities, and a visitor center. It does offer quite a bit to a visitor. But one of the first things you'll notice about the Grand Canyon is that the view changes constantly. The combination of sun and clouds will create fast-moving shadows. The same is true if you walk just a few yards along the rim. So for the sake of value, please don't limit your views to the South Rim Visitor Center. There is a 25-mile scenic route that begins here called Desert View Drive that affords scores of astounding views along its path. The South Rim and North Rim entrances are separated only by about 15 miles as the crow flies, but driving between the two involves 280 miles. That driving divide helps explain why all but a few visitors choose one rather than two entrances. But if you have a chance to see the canyon from the North Rim entrance, take it. And structure your trip so that you have enough time to enjoy as many viewing angles as possible. If you enjoy hiking, the Grand Canyon presents some unique and wonderful opportunities. With those benefits, there are also many dangers for which you must be prepared. Let's start with railings that might be seen at the trailhead. Those railings could be the last you'll see on your route. Pay attention to your footing at all times. If you don't have adequate footwear or water, don't start. It's important to note the level of difficulty on a given trail and make an honest appraisal of your own fitness and hiking skills. Starting a trail labeled difficult on a whim because it seems easy enough will produce unpleasant results. Time is a key factor too. It generally takes twice as long to move uphill as downhill. So that two miles that you did in 45 minutes will require 90 minutes or more on the return. Is there enough daylight for the round-trip? It's possible to take hikes as a group -- a good way to protect yourself in the event of an accident on the trail. Always travel with other hikers if at all possible. One final thought: Medical facilities here are limited. Emergency treatment might require a long, expensive ride (or flight) to a distant hospital. Skywalk is a Plexiglas platform that juts out over the Grand Canyon, allowing people the illusion of walking in thin air outward from the rim and about 4,000 feet above the canyon floor. Some of the revenue generated from the pricey ticket for Grand Canyon West will go to the Hualapai Tribe, which owns the land on which Skywalk is constructed. You must pay to enter the land and to visit Skywalk. Another consideration is Grand Canyon West, where you go to approach Skywalk, is near Kingman, Ariz., which is quite a distance to the west. If your travel plans involve visiting the South Rim and perhaps Lake Powell, Kingman is a significant detour. The prices and the effort to get there are offset by the realization that the revenue will benefit an impoverished community and afford some great views. But visiting the Skywalk does require some planning. Set aside at least a day for the experience. When you look out over the canyon from the South Rim, you are standing on a spot that's about 7,200 feet above sea level. Air temperatures at that altitude tend to be cooler than most visitors are expecting, especially outside the summer months. In fact, many of the roads around the rim are closed during the winter because of snow and ice. Hikers who descend to the floor of the canyon and the Colorado River will find temperatures that are far warmer than what they experienced at 7,200 feet. Summer readings on the floor routinely exceed 100 degrees. Underestimating the impacts of these facts could make for uncomfortable, even dangerous conditions. Dress for the season and prepare for the temperatures in order to preserve the value of your visit. There are six lodges on national park property with nightly prices that range between $93-$215. While many budget travelers will find these prices high, there is an argument to be made that equipping and maintaining a lodge in this environment costs a bit more money. But cost doesn't prompt as many disappointments here as the "No Vacancy" signs. Lodge rooms are booked quickly for the busy summer months. It might be necessary to reserve your room(s) many months in advance. If that isn't possible, it pays to make plans outside the park. There are seven hotels in Tusayan, which is the nearest town to the South Rim entrance. Kanab, Utah offers lodging to those visiting the North Rim entrance. Page, Arizona, on the southwestern tip of Lake Powell, has a variety of lodging choices, but remember that it is about 130 miles from the South Rim Entrance. Picture yourself strolling The Strip in Las Vegas, enjoying the atmosphere and the nightly outdoor spectacles. As you walk along this route, you are likely to see the signs pointing you to a one-day tour of the Grand Canyon. There are people for whom this trip might be a good idea: visitors from distant lands, for example, who might not ever return to the region. But is this a good idea for you, as a budget traveler? Prices can be hefty. Some tours involve taking a helicopter for the round-trip. That option will come at prices approaching $500/person. Those who travel on the ground will pay less money​ but expend a lot more time. Driving to the canyon and back is about 600 miles round-trip. For every hour you spend admiring the canyon views, you'll spend several hours driving. If visiting the Grand Canyon from Las Vegas in one day is a questionable strategy, there is little question that nearby attractions warrant attention in your itinerary planning. The red-rock canyons of Sedona, Ariz. are within two hours of the South Rim Entrance. To the north, the brilliant national parks of southern Utah are worth including if at all possible. Zion National Park is about 150 miles from the North Rim Entrance; Bryce Canyon National Park is about 140 miles away. Plans that simply put you at the Grand Canyon and then back home should be considered carefully. Why not add a few extra days and visit these other value-packed sites?